Q. Do you offer Neighborhood Watch signs with a burglar on it? Yes, we do. But be aware that there is some controversy surrounding some of the burglar-based neighborhood watch symbols. We’ve noticed that more abstract symbols have recently become more popular. For our critique of neighborhood watch symbols, click here. Q. How have No Trespassing signs and notices changed over the years? The original notices were spawned by Teddy Roosevelt's work with national parks and wildlife refuges to protect our fish and native animals. These signs proved so popular that business, farms and ranches started to use them. Now, these notices are ubiquitous – even private homes sport No Trespassing notices. For more history, click here. Q. What can I do to stop someone from repeatedly trespassing on my property? Signs help, of course. They show that you value your privacy. Short of a personal confrontation, the next step is to notify them and the police department by letter. Click here to learn more. Q. How can I start a Neighborhood Watch group? Yes, take the initiative.You’d be surprised how easy it is to start a group! Meet your neighbors. Start petition. Talk to your local police force. For a detailed plan, click here. Q. What obligations do I have to protect our employees from security threats? Q. Can I restrict visitors to our house from taking pictures? Is a sign sufficient notice? Yes and yes. One caveat: you can’t stop people from taking pictures of things that are in public view. If someone’s taking pictures of your house from a public street, you can ask them to stop voluntarily, but you have no legal right to make them stop. We have found, though that signs help and that most visitors will obey your instructions. Q. When does soliciting become trespassing? Soliciting becomes trespassing when solicitors enter or remain on property without the authorization of the landholder. While the specific requirements differ from state to state, in general, you can ban solicitors from your property by placing “no soliciting” signs at the entrances to your property. Q. When is loitering illegal? This varies from place to place. Some places, like Washington DC, don’t have a general loitering law at all. In general, trespassing laws still apply for private property and unwanted guests can be removed by the land holder. Q. Are surveillance warning signs required? Strictly speaking, signs are not required on private property. But they almost always make good sense. They help you deter crime and leverage your investment in a CCTV system. Whereas a video system can record a vandal, for example; warning signs can help stop vandalism before it even starts. Q. I work in a middle school and would like to start an anti-bullying campaign. Do you have any suggestions? You’re in luck! Check out our #TakeNoBullies program. Countless schools have taken advantage of our free button and sticker program. We have found that a little bit of training can make a huge difference at a shool. Learn more here. Q. What types of sign mounting posts do you sell? We offer a complete line of u-channel, round, and square sign posts. We stock these signposts in both green and galvanized finishes. Custom and decorative signposts are available. To buy signposts, click here. We offer aluminum sign blanks in two alloys, 5052-H38 and 3105-H191. We carry multiple gauges (thickness) including .040", .063", .080", .100", and .125". All aluminum is processed in-house for quality control. We level, treat, cut, punch and radius aluminum coils into road sign aluminum blanks in our 65,000 square foot production facility. Q. How do I fasten the signs to a fence? Use our fence clips. They come in pairs. For most people, fastening a sign with our clips is usually a one-person job. Q. We have had an accident. Although no one was seriously hurt, we are worried that we need a better sign at the street corner. Do you have any suggestions? Consider adding a 'blazer' to your sign. This fluorescent reflective sign snaps into the sign's metal post. It is hard to miss and might help! You could also consider a new replacement sign as over time, a sign's brightness can decrease over time. Q. Do I need to add the penal code number to our No Trespassing Signs? The short answer is no. In fact you don’t even need to post a No Trespassing sign for it to be illegal. However, it does remove all ambiguity. A threatening sign will deter potential violators from trespassing. Posting the penal code can add extra emphasis on the fact that trespassing is breaking the law, and this extra emphasis can help. Q. Skateboarders are wrecking our railing. What can I do? If the railing is on your property, you can keep skaters off of it. If the railing isn’t, you can’t. Simple as that. For a railing or stairs that are on public property, talk to the local village, neighborhood association or city government. In many cases, they can provide a rules sign at no charge to you. Aluminum studs or guards are understandably hated by skateboarders and a popular deterrent. For stairs and railing that are on your private property, you have a number of options, including both guards and signs. Q. Can I stop skateboarders from damaging the bench in front of our store- even if there is no ordinance against skateboarding? They leave black marks and wax on the bench. “Grinding” can cause some major damage to property. There are, of course deterrents that could be used (anti-skateboard aluminum brackets, for example). But, unless you own the property, you do not have the authority to prevent aggressive skateboarding in front of your store. For more information, click here. An important question for a sign is whether you want to ban just skateboarding or if you want to include a more general set of prohibitions. Q. Are Beware of Dog signs required? What if my dog is aggressive? In most US states, you’re liable for the actions of your dog, period, regardless of signage. In a minority of states, you’re normally not liable unless (a) you know that your dog is dangerous, (b) you broke an animal control law, or (c) you were otherwise negligent in handling your dog. If you know that your dog is aggressive or dangerous, many state and local authorities require you to take additional precautions to protect the public from your dog. The definition of “dangerous’’ varies by state. Signs may be required. Check with your attorney or local animal control agency for details. These signs serve both as a way both to warn unwary visitors that they may encounter an aggressive dog and, next, to deter unwanted visitors or potential burglars. Q. Do Beware of Dogs signs deter burglars? Like most criminals, burglars tend to prey on the most vulnerable, and no one likes meeting an angry dog. Signs can only help convey the warning. Q. Is it legal to post a No Dogs Allowed sign at the front of my store? It is legal to keep dogs out of your store, but you must make an exception for service animals under the Americans with Disabilities Act. Q. Can a business request that a patron validate that their dog is a bona fide service dog? According to the U.S. Department of Justice, you can ask a patron whether the dog is a service dog, but you are not allowed to ask for proof that a particular dog is a service dog. It is against the law to ask for documentation of disability. Q. Can a service dog eat in a restaurant? This depends on your local health code. Check with your local authorities. In most cases, we have seen that the local restaurant manager has a good deal of discretion and can restrict a service dog from eating at the table or from using the restaurant’s plates. Q. Can I bring my dog into a grocery store? Check with your local health department and the store’s management. Under most conditions, pets are not allowed in facilities that serve food, except for service animals. Many grocery stores also ban service animals from the shopping cart and insist that service animals be on a leash. Q. What’s the best size for a Video Camera Sign? Certainly, the larger the sign, the further away your message will be seen. The sooner a would-be criminal becomes aware of your surveillance system, the more likely they will be deterred. Savvy property owners actually post several signs - not just at the perimeter of your surveillance camera range, but also in traffic-heavy areas. Multiple signs reinforce your surveillance system and leverage your CCTV investment. The rule-of-thumb for legibility, is that each inch of letter height gives 25 feet of viewing distance. Other factors matter, however: lighting, angle and, if you in a car, speed. The three signs below are most common. The larger 24” sign might be used along roadways, the 18” sign is often used on entrances, sidewalks or pedestrian areas and the 10” tall sign is used at the door. Q. How many surveillance signs do I need in my store? This depends on how many points of entry you have and how many cameras you have installed. 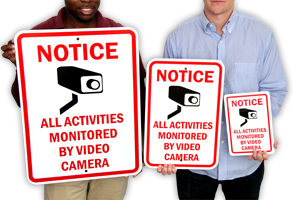 We recommend that surveillance signs should, at the minimum, be visible as you enter and as you check out. For a more aggressive stance, many customers insist that a sign be visible from every key aisle. Think, also, of the employee stocking areas. Employee theft has been reported to be 57% of the total in-store retail theft cost. To learn more about how cameras and signs are changing anti-shoplifting strategies, click here. Q. How can surveillance cameras and signs keep my business secure? CCTV systems have been proven to thwart crime. Click here to learn more about this topic. Q. How far from the camera should I post my CCTV warning sign? The CCTV warning sign need not be next to the camera. The most important thing is that the sign be visible when the camera is in range.